This simple equation fits the published data exceedingly well (±0.01"). Between 1976 and 1985 William H. Garzke and Robert O. Dulin published a series of books about battleships built or planned after the "battleship building holiday" imposed by the Washington Naval Treaty of 1922 and expiring at the end of 1936 (Garzke and Dulin, 1976, 1980, 1985). These books are highly detailed in their description of the design procedure, technical characteristics, operational histories, and damage analysis of these ships and include a thorough characterization of their guns: bore (shell diameter), shell types and weights, muzzle velocity, range and angle of fall as a function of elevation and of shell penetration of vertical (side) and horizontal (deck) armor as a function of range. These penetration values are often quoted and used to compare the armor penetration power of large naval guns and for computer modeling of ship-to-ship combat for World War II naval games. These penetration values are reported as being calculated using "a detailed US Navy empirical equation" against US homogeneous Class "B" armor, but the equation is not given, nor is there any reference to its exact formulation or origin. Nathan Okun (2001) describes the USN empirical formula for armor penetration as being formulated by the United States Navy (USN) in the 1930s to calculate the penetration of armor piercing, capped (APC) shells fired by large naval guns against horizontal armor. It is derived from the Thompson all-purpose armor penetration formula (or "F-formula) of 1930 for penetration of APC shells against US Class "B" homogeneous chromium-nickel-steel armor, which is similar to US "Special Treatment Steel" (STS) armor. Mr. Okun has further developed the equation for use with cemented and face-hardened armor plate and to account for potential differences in the construction of individual shell types. Unfortunately, the published armor penetration values of Garzke and Dulin are not consistent with these equations; therefore an attempt was made to "reinvent" their equation by reverse engineering based on their published results. An exhaustive search of Tony DiGiulian's "NavWeaps" website (1997) for World War II naval guns turned up 14 naval guns with penetration data from Garzke and Dulin's books at zero range and at zero obliquity (Table 1). Table 1: Raw data for armor penetration by large naval guns. T is the maximum thickness of US homogenous Class B armor predicted to be penetrated under these conditions, in inches. There are also armor penetration values for the British 14"/45 Mk VII gun mounted in the King George V battleships, but the values quoted were "partly based upon the USN Empirical Formula for Armor Penetration and partly based upon official data" (DiGiulian, 2013). These values were not included since they do not appear to have been derived solely from the Garzke and Dulin formula. "Maximum thickness", although never defined by Garzke and Dulin, is assumed to mean the maximum thickness of armor that the shell can penetrate and still be capable of full detonation. and plug in the maximum penetration values for the guns listed in Table 1 and their ballistic characteristics. If this is the same formulation as for the Garzke and Dulin penetration formula, then "s" should be the same for all guns against the same US Class B homogeneous armor. Table 2: Calculation of general scaling factor "s" and penetration. The average scaling factor "s" is 5.091 (±0.243) x 10-7. The values for "s" vary a bit ( ca. 5%) and consequently, the values for T(calc. ), calculated with the average value of "s", also vary somewhat from the published values. The root mean square deviation (RMSD) across all 14 guns is 1.38". Since both the published values and those determined here are calculated results, ostensibly with the same formula, these results are rather disappointing (Fig. 1). Figure 1. Armor penetration values published on the "NavWeaps" website (black line) vs. penetration values calculated using the USN Empirical Formula for armor penetration (blue dots). RMSD is 1.38". Correlation is 0.8836. Table 3: Armor penetration calculations using the USN Empirical Formula for Armor Penetration with modified exponents for D (shell diameter), W (shell weight), and V (shell velocity) and an optimized "s" scaling factor. "T(inches)" is the penetration published by Garzke and Dulin, "T(calc.)" is the penetration calculated by equation 1. The root mean square deviation for the 14 guns has now dropped to 0.011", essentially to the accuracy of the published penetration values, which were typically reported to the nearest 1/100th of an inch. Not surprisingly, plotting the original Garzke and Dulin published penetration values against the values calculated from the formula above (equation 1) gives essentially coincident lines (Fig. 2). Figure 2. Armor penetration values published on the "NavWeaps" website (black line) vs. penetration values calculated using the USN Empirical Formula with modified exponents (blue dots). RMSD is 0.011". Correlation is 0.9999917. This astonishing accuracy is only possible because both sets of data are of calculated values and are not being fitted to real-world measurements, although the Garzke and Dulin formula itself was certainly derived from measured data. More published values would help validate this formula, since they weren't used to generate it. As it currently is, determining 4 values from 14 data points give an observation to variable ratio of 3.5:1, which , while well over-determined (> 1:1), is still rather low. Might it not be that the original exponents were actually 0.55, -0.65 and 1.10, respectively? Calculating exponents in the 1930s and 1940s was far more difficult and time-consuming than today. Would trimming off the last two digits, possibly with some compensation in the scaling factor, still give acceptable results, i.e. differences in the 0.01" range? It was found necessary to have 4 digits in the scaling factor, since the penetration values themselves have 4 digits. The RMSD between published and calculated values (Table 4) is 0.012", only marginally worse than using 4 digits in the exponents (Table 3). Table 4: Penetration calculations after simplifying the exponents and rescaling (equation 2). These results compare very well to those in Table 2. It has proven possible to reverse engineer the empirical formula for calculating the oft-quoted armor penetration values of Garzke and Dulin for large caliber guns. The formula is simple and the results are dependent on only three characteristics of the gun's shells in question: its diameter, its total weight and its muzzle velocity. These results are only valid for armor-piercing, capped (APC) shells. "α" stands for "is proportional to." In other words, for a constant velocity, penetration is linearly proportional to the diameter of the shell, which agrees with the rule-of-thumb that the thickness of a battleship's side armor should be the same as the bore diameter of its main guns. It also explains how this simple formula can fit the penetration data of guns whose bores run from 11.1" to 18.1" and might even offer some hope of being valid for smaller caliber guns, but again, only for APC shells. It also predicts that higher-than-average penetration for a given diameter shell can be achieved either by heavier shells for that diameter, but at the cost of a much smaller burster charge (the American approach in WWII), or by higher muzzle velocities, but at the cost of wearing out the guns too quickly (the German, French, and Italian approach). Lundgren and Worth (2009), using the FACEHARD program of Nathan Okun (2001), have calculated and tabulated penetration of face-hardened side armor from five WWII belligerents (Great Britain, the United States, Italy, Germany, and Japan) for naval guns from these nations, plus France, at various ranges, but always with zero obliquity (shell impacting perpendicular to the face of the armor). Most of the guns are from battleship or battle cruisers, although a few are from heavy and light cruisers. For the comparison to the results from the Garzke and Dulin empirical formula, as formulated in this article (equation 2), only the FACEHARD penetration at range = 0 was used and only for "effective" penetration (complete penetration and the shell still able to detonate) against British side armor (this seems to be closest to the Garzke and Dulin results). In addition, only results with armor-piercing, capped shells were used. The results from the Garzke and Dulin empirical formula and FACEHARD are displayed in Table 5 and plotted against the diameter of the APC shells in Figure 3. Table 5: British armor penetration calculations using the Garzke and Dulin empirical equation "T(G&D)" and using the FACEHARD program "T(FACEHARD)". The results have not been scaled to each other and are measured in inches.. Figure 3. 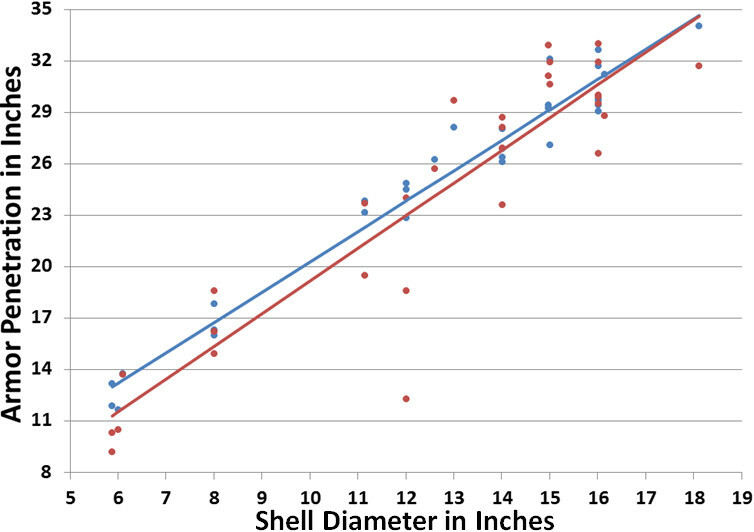 Armor penetration values calculated with the Garzke and Dulin empirical formula (blue dots) and Nathan Okun's FACEHARD program, as compiled by Robert Lundgren and Richard Worth (red dots) against the diameter of the shell in inches. The blue and red lines are the best fit lines through the respective dots. The Garzke and Dulin values scatter much less from their best fit line than those from FACEHARD (RMSD = 1.25" vs. 3.03"), possibly because the Garzke and Dulin formula has only three variables and two of them are highly correlated (shell diameter and weight). FACEHARD takes far more parameters into account, e.g. shell construction (hardness, nose shape, fuzing, cap construction) and the armor itself, e.g. how deep the armor is "hardened", presence/absence of a "decapping" layer, etc. In addition, the Garzke and Dulin data is against US homogeneous Class B armor and the FACEHARD results are against British cemented armor. Despite these differences, the results are generally quite similar with an overall correlation of 0.9253 with the FACEHARD values being, on average, about 3% smaller. The RMSD between the values is rather large, 3.00", but much of this is due to the differences for the French 12" gun mounted in the old Courbet-class battleships, predicted to penetrate almost 23" of armor by the Garzke and Dulin formula and just a bit over 12" with FACEHARD. Removing this single discrepancy brings the RMSD down to 2.3". I've not found any explanation of, or even allusion to, very poor penetration of the French 12" gun in the literature, roughly half of what one would expect. Table 6: The "Top Ten" guns ranked by armor penetration as calculated by the Garzke and Dulin empirical equation and the FACEHARD program. The rankings from the Garzke and Dulin empirical formula seem to be dominated by the size (caliber) of the gun, with only the guns of 15" or larger being listed and, except for the Italian 15" gun, are strictly ranked by gun caliber. The rankings by FACEHARD are also dominated by the largest-caliber guns, but also includes the 13" guns of the French Dunkerque class battle cruisers. The Garzke and Dulin list includes the guns of the Iowa, Nagato, and South Dakota (all 16"ers.) that are replaced by the guns from the Lion (16"), the Queen Elizabeth (15"), and the Dunkerque (13") in the FACEHARD list. Due to the popularity of the three "battleship books" by William H. Garzke and Robert O. Dulin (1976, 1980, 1985) among naval enthusiasts, the armor penetration values they published in these books have become very known within the naval gunnery / warship community and have been used for modeling ship to ship combat in a number of naval wargames. Unfortunately, Garzke and Dulin do not provide the exact formula they used to calculate these values, nor do they reference the origin of this formula. Tantalizingly, they state that the penetration values were calculated with "a detailed US Navy empirical equation" (Garzke and Dulin, 1975, p. 308 [1995 revised version]; 1980, p. 373; 1985, p. 501). Their values do not fit the USN Empirical Formula for Armor Penetration, derived from the Thompson all-purpose armor penetration formula (or "F-formula) of 1930. An attempt to reverse engineer their equation from their published values using least squares was successful, leading to a simple equation that generates the published values with surprising accuracy. Least squares [see Weisstein (2016) for a detailed introduction to this subject] is a technique for finding the best parameter values in an equation that fit the observed (measured) data. More precisely, it finds those values that minimize the sum of the squares of the differences between observed and calculated values. It is probably best known for its use in fitting a best straight line through a set of point that are approximately linear, for example, the "SLOPE" and "INTERCEPT" functions in Microsoft's Excel spreadsheet program. The advantage of the least squares technique is that it gives the absolutely best parameters that fit the data. One weakness of the method is that, since it minimizes based on the square of the differences between observed and calculated values, it is very sensitive to outliers (potentially bad data), that, if really due to a bad or spurious measurement or other error, can significantly degrade the results. This weakness can be overcome if the number of parameters to be fitted is small compared to the number of observations. Typically one would like to have at least 3x as many independent observations as parameters. The more high quality data one has, the easier it becomes to spot bad data. Another limitation is that reliability is only guaranteed within the boundaries of the input data, in this case, only for guns firing APC shells with diameters between 11.1" and 18.1". Extrapolations outside of these limits can be made, of course, but there is no real data to support this. An Excel spreadsheet for using least squares for determining the values for an equation with three parameters and a constant term is available from the author (Priestle, 2016). ^The official designation for this gun was actually "40cm/45 Type 94" as part of the Japanese effort to hide its true size. ^2.12.2Most of the MV values in this table are for "new gun" data, but for these two UK guns Garzke and Dulin chose to use "average gun" values. ^Although the published MV for this gun is 2450fps, Lundgren and Worth use 2400fps. Garzke Jr., William H. and Dulin, Robert O. (1976, revised 1995) United States Battleships, 1935-1992, pp. 308-317, United States Naval Institute, Annapolis, Maryland. Garzke Jr., William H. and Dulin, Robert O. (1980) Allied Battleships in World War II, pp. 374-375, United States Naval Institute, Annapolis, Maryland. Garzke Jr., William H. and Dulin, Robert O. (1985) Axis and Neutral Battleships in World War II, pp. 502-503, United States Naval Institute, Annapolis, Maryland. Priestle, John (2016) A Microsoft Excel spreadsheet with the raw input and calculations is available from the author (priestle@bman.ch). Unfortunately, it’s a German version of Excel and the function names may need translating. The author gratefully acknowledges detailed discussions about the USN Empirical Formula for Armor Penetration with Mr. Nathan Okun of Oak View, Calif., USA.